In an effort to empower community members with much needed computer skills, the Africa Health Research Institute (AHRI) has revived its computer training for participants from surrounding communities. This follows a request from traditional councils to have the programme continued. For the first round of training, Izinduna (local traditional leaders) from three surrounding izigodi (areas) in Mpukunyoni each nominated five people from their communities. The Mdletsheni Traditional Council will also be part of the training, with two izigodi included. 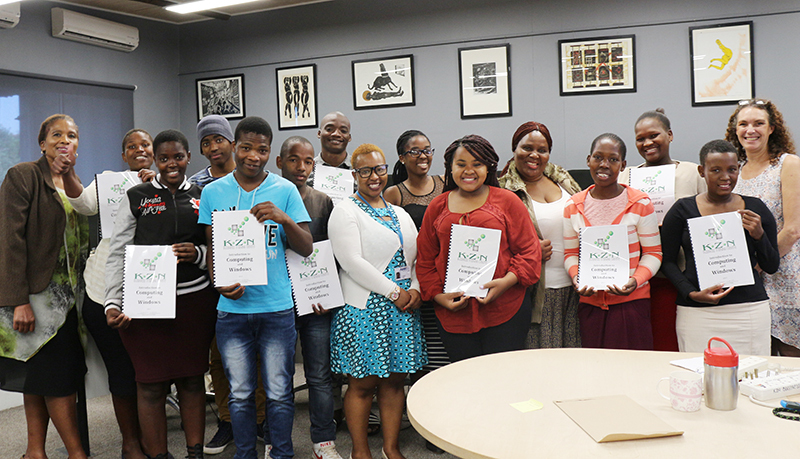 From 2005 to 2015 the Africa Centre for Population Health provided computer skills training to many members of the Mpukunyoni and Mdletsheni communities, and the decision to re-start this training has been well received. The first round of training kicked off on 5 August. Each training session runs for four consecutive Saturdays, and trainees receive a certificate for completing the course. “We would like to thank AHRI for reaching out to the community’s needs and organising this training. We are very happy about the training the facilitators provided us; they were so helpful and friendly. We are also grateful to Izinduna for this opportunity,” said a recently graduated trainee, Phindile Gumede. The training is facilitated by the KZN Business Training Centre. The programme is set to continue until June 2018.